Today we painted with oil pastels. 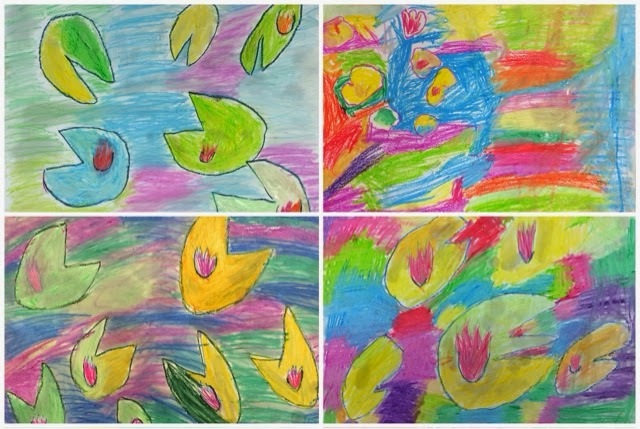 I talked to the children about Claude Monet and his garden in Giverny, France. We spoke about water reflecting things around it because it has no color. I told the children to pretend that they were small frogs sitting on top of a lily pad. What kinds of plants and flowers could be seen around a small pond? Then, when we paint or draw water, we are really drawing the reflection of the things around it... the sky, flowers, plants, and trees in the garden. 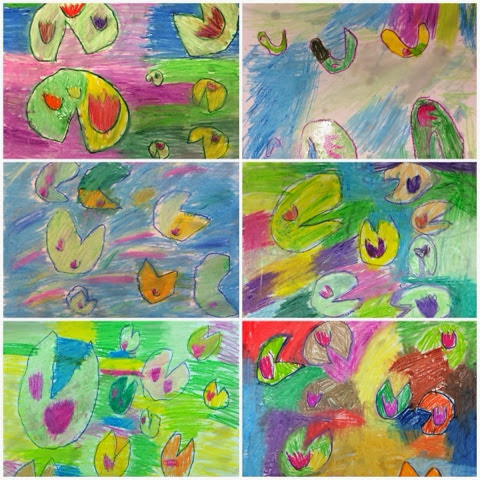 We took colored pencils first to draw the lily pad and flower shapes. Then we colored our pond with oil pastels on Bristol paper. At the end, we used cotton swabs dipped in baby oil to smear and blend the colors. This gives the art a painterly look, like Monet's oil paintings. The baby oil dissolves and blends the colors beautifully.